"My father said that Great Grandpa Mike died sitting at the breakfast table while his wife Anna was at the stove making breakfast. He stopped replying to what she was talking about, she turned around and he was dead. Presumed heart attack. I believe he died some time in the late 50's, before I was born. Anna died around 1977 or so, I remember it being the only time I ever saw my father shed a tear." Images and information courtesy Kevin Troy Skroch. 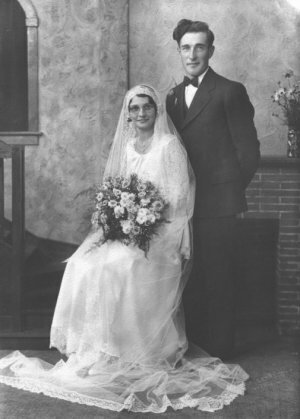 Married: Henery J. Sygulla, 14 Oct 1931, St. Peter/Paul Church, Independence, WI. 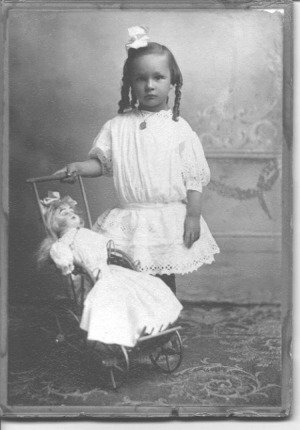 Taken about 1910 in Independence, WI by a a traveling photographer.